36th America's Cup: mark your calendars for March 6th through the 21st in Auckland, New Zealand in 2021. Entries for challengers opened on January 1st this year and closed on June 30 with late entries accepted until December 31st. The America's Cup World Series will be held in 2019 and 2020 with a Christmas regatta in December 2020. The Challenger series will be held in January and February 2021 with the America's Cup match in March. 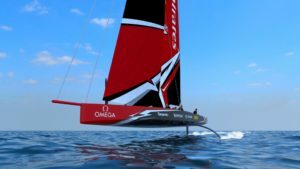 Prior to Emirates Team New Zealand winning the 35th AC in 2017, Oracle (the defender at the time) and four of the five challengers had signed a framework that would have seen the 36th America's Cup in 2019 and the 37th in 2021, with the existing 35th Cup class boats, the AC50s, and a pre-selection America's Cup World Series tournament with the same boats. Team New Zealand, the eventual AC 35 champion, had opted to not sign the framework agreement, and they were not bound by its terms, freeing them to set their defense for 2021, while also choosing the foiling monohull AC75 boats, “in hope of making the competition more attractive to sailors”.